BFT and BUSD met for the second time on Monday, March 25th. The BFT team welcomed guests representing the BFT Special Education Working Group Josh Austin, Julia Hart , Mary Machens and Lila WIlkinson to the morning session. These Special Education teachers added very useful perspectives and information to the discussion of BFT’s proposals for Special Education caseload caps and assessment limits. BFT proposed a limit of 18 students on the caseload of a Special Education case manager with a Mild/Moderate caseload and 8 students for teachers working with a Moderate/Severe caseload. Julia Hart, Cragmont Mild/Moderate teacher, spoke about the benefits of the BFT proposal for students with IEP’s. She noted that Berkeley’s model of providing Special Education services is unique and needs to be fully staffed in order to live up to its full potential. Berkeley teachers are often serving students who need significant support to access the curriculum in a general education setting. Many of these students would be served in Special Day Classes in other districts. With more Special Education staffing, teachers would be able to plan and deliver high-quality specialized academic instruction which would lead to higher achievement and more students exiting Special Education. Lila Wilkinson, Malcolm X Mild/Moderate teacher, added that the proposal would benefit all students. By creating more Education Specialist capacity, Special Education teachers would have more time to support and collaborate with general education teachers, to modify curriculum for students on their caseload and to provide the direct instruction those students need. Classroom teachers would be able to focus on Tier I and II RTI interventions and improve student achievement across the school. Adequate support would also improve BUSD’s ability to attract and retain highly qualified case managers. Both teachers emphasized the cost savings that could result from this increased investment, including reduced costs for compensatory education, legal defense and Nonpublic Agency services. BFT also proposed a limit of one formal assessment per month for case managers with a Mild/Moderate caseload, and one per every two months for case managers with a Moderate/Severe caseload. Teachers spoke to the time-consuming nature of performing these assessments, which can take 20-25 hours each and can come in unmanageable clusters at certain times of the year. The result is often a loss of time serving students or working with classroom teachers. As with the caseload caps, this proposal is intended to help all students by allowing Special Education teachers to spend the majority of their time in classrooms. BFT proposed that the hourly teaching rate be increased to $55 per hour, from the current rate of $36.56. Increasing this rate would attract more teachers to provide after school supports to students who need them. The potential for closing BUSD’s various equity gaps through extended school time is huge and our highly skilled teachers are being underutilized at the current rate of pay. BFT proposed that in emergency situations when elementary students are assigned to another teacher because a substitute is not available, the teacher receiving the students be paid a percentage of their per diem rate. This would align compensation for this service with their secondary colleagues. Currently, elementary teachers are paid a percentage of the daily sub rate. BFT noted the challenges to accepting a group of unknown students into the classroom without advance notice, choice or time to prepare materials for them. Teachers in this situation are often forced to rearrange lessons for the entire day and to devote extra time and attention to the assigned students. BFT and BUSD continue to negotiate the details of the 2020-2021 calendar. At this session, BFT proposed that there be a week between the end of the elementary trimesters and the date report cards are due. This would allow teachers to include information from end-of-trimester assessments into their report card comments and give a longer window to provide thorough and thoughtful information to families via report cards. You can view the latest proposal here. Teachers across the nation are fighting the same battles! 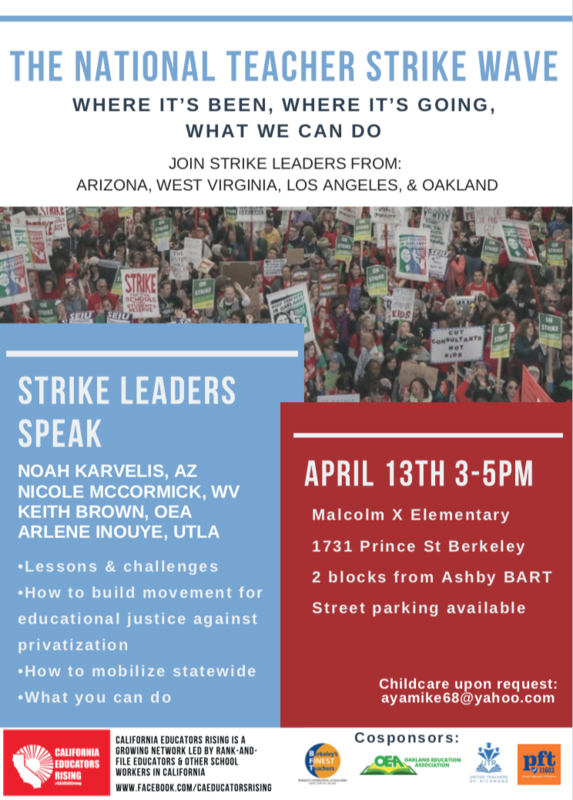 Come learn more about our common struggle at a forum presented by California Educators Rising and co-sponsored by BFT on Saturday, April 13 from 3-5 pm at Malcolm X School, 1731 Prince Street Berkeley. All negotiations updates are posted on our website here. The BFT and BUSD teams will meet again for an all-day session on Friday, April 12th. For information or to offer comments please contact BFT Vice-President Matt Meyer at mattmeyerbft@gmail.com. This Negotiations Update was prepared by BFT Treasurer Cynthia Allman and edited by the BFT Negotiations Team.